If you thought that Hurricane Sandy was the last time Instagram hit a big record, you thought wrong. During Thanksgiving, over 10 million phones were uploaded, about 200 per second. 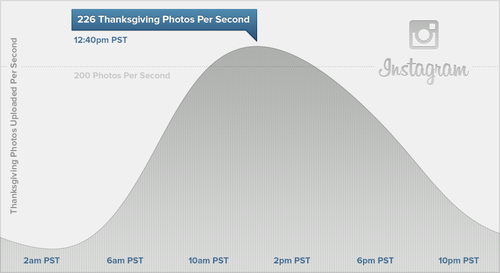 ccording to the Instagram blog, users shared more than 10 million photos with Thanksgiving-related terms in the captions, with a posting rate peaking at well over 200 images per second during the busiest hours of the day. Overall, Instagram says the day broke all its records, with more than twice as many photos uploaded on Thanksgiving compared to the day before. It's not terribly surprising either as some people do like taking pictures of their food. I didn't even bother to take pictures of my turkey this time around, but if you did -- or didn't, you can share in the comments below. Perhaps I might make a post where you can post your best picture of your turkey via Disqus.